Once upon a time in a land far far away (Ypsilanti, MI), my roommate and I decided we needed to start brewing beer in our apartment. So one Saturday morning, we ventured to the supply shop, bought a bunch of equipment and an "everything you need in one box" kit to make some Oktoberfest. It turned out pretty well, minus the fact that we added too much water, thus creating the first ever "Oktoberfest Lite." 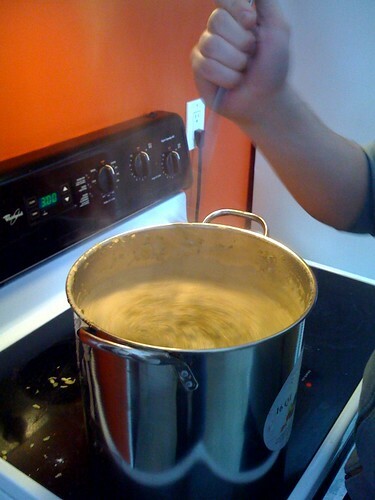 As we brewed successive batches of different beers, we became more confident, and experimented a bit. There was debate about which of our beers was the best -- Ian liked one because it tasted like apples, but I told him that was because we probably didn't disinfect everything properly and contamination can lead to an apple-y taste (this is true). Our last (failed) endeavor was to make a chocolate stout. We went to the store to get what we needed, forgot to grab some things, and then the bags of grain broke open in the parking lot and a surprising amount of grains went into my shoes. We soon moved out of that apartment and went our separate ways, with Ian keeping the cat in exchange for me keeping the brewing equipment. Over the past two or three years every time we got together, we'd say "we should brew some beer soon." Well, we were just spewing hot air -- until this weekend. Our brew features chocolate malt, and LOTS of pale malt extract, so we expect it to be light in color and heavy in alcohol. Here's what happens on homebrewing day one (and look for progress updates over the coming weeks). Steep the grains in the sock thing (don't use a real sock, please) until the water reaches 170º. There are two gallons of purified water in the pot. 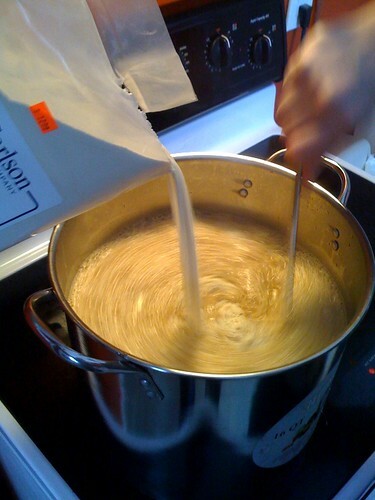 Add the malt extract once the water has boiled, then wait 'til it begins to boil again. 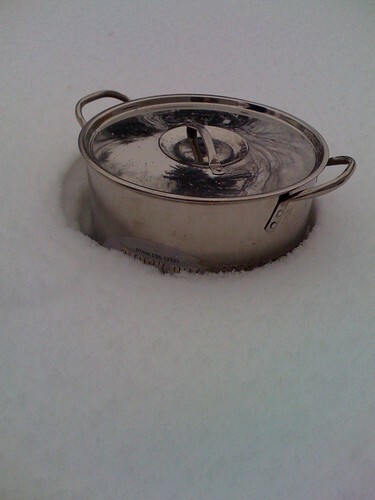 It will probably boil over at least three times. 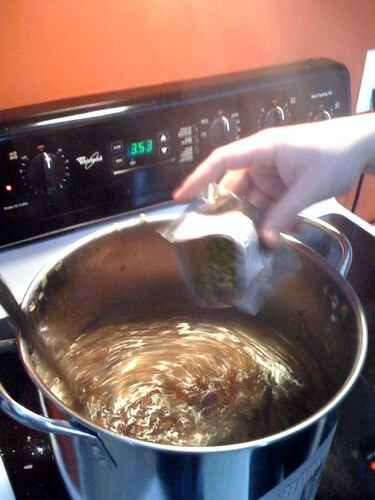 Add bittering hops then boil for 55 minutes while stirring incessantly so that sticky malt sludge doesn't burn onto the bottom of the pot. 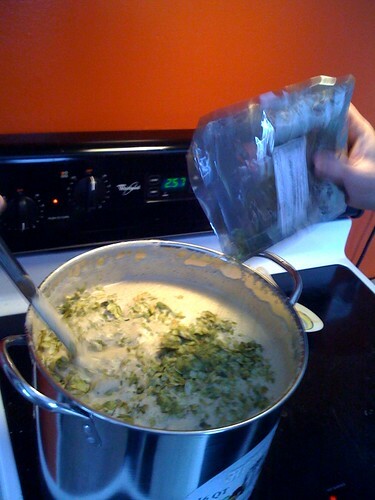 Add finishing hops and boil for five more minutes. Cool rapidly to 70º. We have not successfully cooled the wort (pre-beer stew) rapidly, ever. And no, we usually don't leave the lid on. We just didn't want a squirrel to get in there. 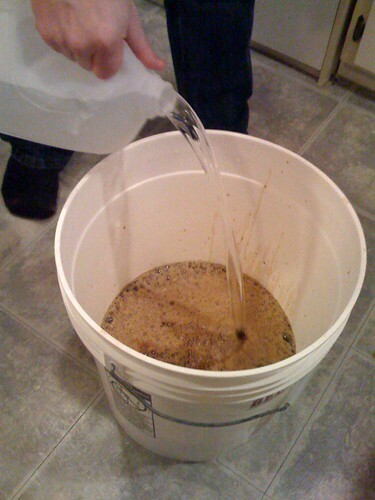 Add three more gallons of purified water to the wort in the fermenter. The prior two gallons have boiled down significantly. Add the yeast. 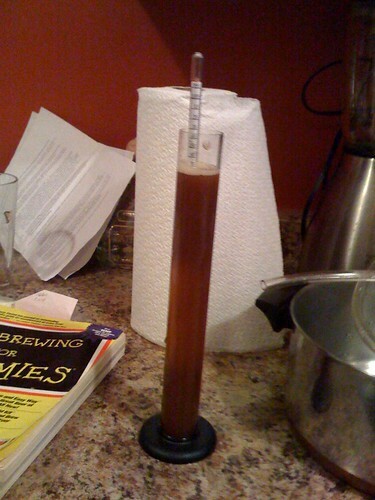 Use a hydrometer to determine the wort's "original gravity" to help determine alcohol content later on. Now you know what the "high gravity" comes from on your favorite malt liquor's label. And yes, you can see "Homebrewing for Dummies" here. 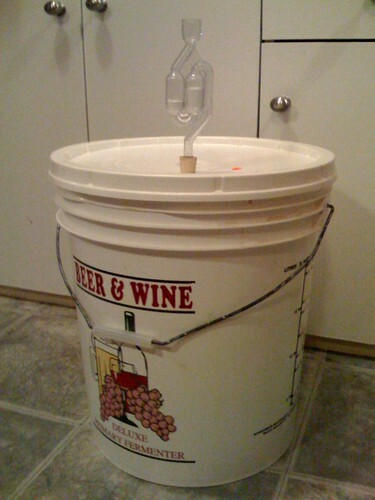 Seal up the "deluxe fermenter" and secure the airlock. 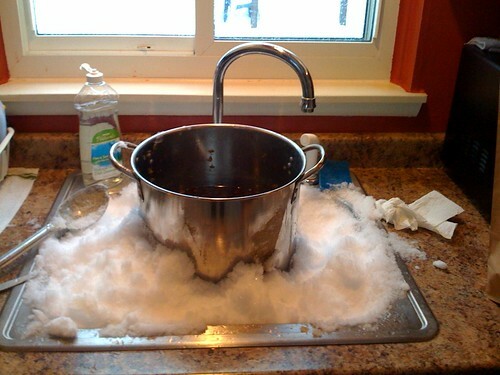 Be nervous that it's not going to work until it starts bubbling the next day, then call your friends and brag. 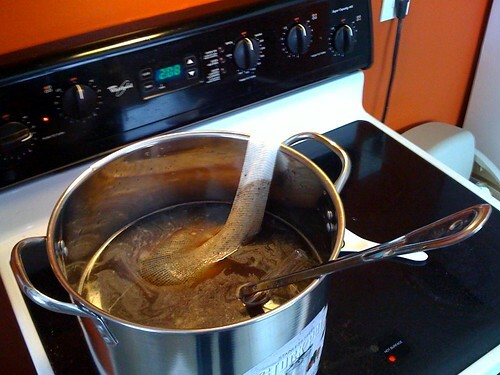 Add ice instead of water to your wort. It'll cool down instantly.